In 1902 she was “the most dangerous woman in America”. 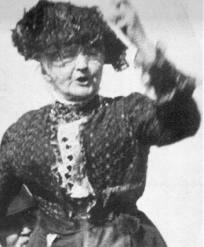 Mary Harris Jones, commonly known as “Mother Jones”, was an Irish immigrant, a refugee of the “Great Famine”. Widowed in 1867 when her husband and four young children died of yellow fever, she became a champion of the rights of children and a tireless labor organizer in the coal fields of West Virginia and other places across the United States until her death at age 93 in 1930. On Sunday, August 28, members of the Unitarian Universalist Congregation in Charleston, together with members of West Fork Unitarian Universalists, will bring Mother Jones to life, up close and personal, through her own words and the words of others from her times. Special music will be provided by members of the Unitarian Universalist Fellowship of Morgantown. Please join us at 11:00 a.m. on Sunday, August 28, at the Progressive Women’s Association Event Center, 305 Washington Ave., in Downtown Clarksburg, WV, behind the Courthouse. Our Religious Education/Life Long Learning Class will meet from 10 a.m. until 10:45. We will gather for coffee and conversation before the service. More about us.